Conflicted over my intrigue of the Extreme Midget Wrestling Federation putting on a show in the Big Country, I used my discomfort as a way to explore why these men perform in this manner. The column was published March 12, 2012. BROWNWOOD — It was an odd weekend. 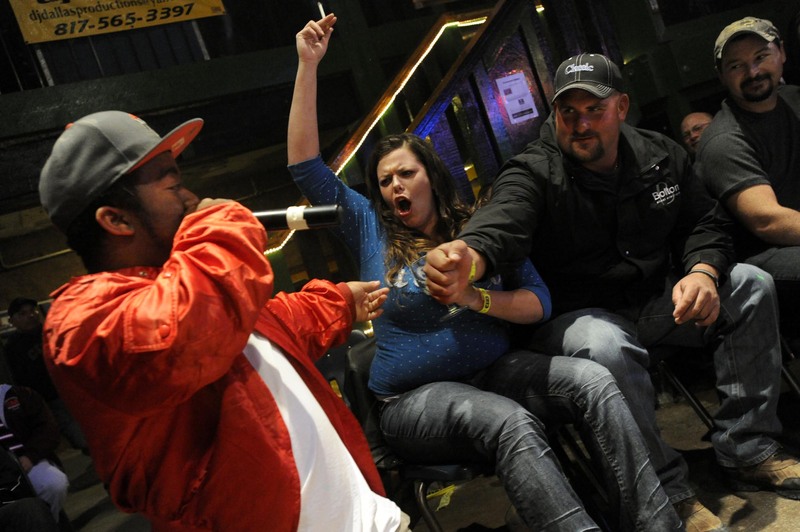 Sandwiched between the Sweetwater Rattlesnake Roundup and Donkey Basketball in Eastland, I subjected myself to the spectacle of the Extreme Midget Wrestling Federation on Friday night at Uncle Dave’s Roadhouse. You might get offended; I think I was at one point. Even writing this story, I wasn’t quite sure how to go about it. I have a friend, Kim Bachmann Baker, whose son is a dwarf, and I did a photo story about him two years ago. Brenden is a neat kid, and during an interview, Baker said “midget” is a derogatory term, yet here was a group using the word as part of their name. I wanted answers, so I met with two of the wrestlers before the show. “So what are your names?” I asked. “I’m Little Nasty Boy, and this is Baby Jesus,” said the taller of the two. “No, what are your real names?” I asked again. Eyeballing me like I’d brought him a snake from Sweetwater, he said his name was actually Danny Campbell and the other was Jamie Brooks. “What he said,” Brooks piped in. Like the wrestlers on television, Campbell’s voice dipped into a deepening growl as he talked. “They wrestled lions, they wrestled bears, they wrestled tigers. We wrestle midgets,” he said. I felt my face heating up as blood filled my cheeks, and I squirmed a bit. I could see he was having fun, even as he glared at me, but I still felt like I was on the edge of a cliff. He trailed off, then picked up the thought again. It sounded like something repeated many times over. He then said there is a difference between the terms beyond whether it might be offensive. “I’m a dwarf,” said Brooks. Still not feeling any better, I just moved on. “Is it wrestling or ‘rasslin’?” I asked. The show was like most other pro wrestling events I’ve covered. Lots of bombast, wrestlers whipping the crowd up to either love or hate them, and plenty of over-the-top action. Set up in the sunken dance floor that used to be an underground speak-easy nearly 90 years ago, bar patrons leaned on railings or paid a little extra for ringside seats. Since it was a bar, the language quickly went salty early into the show. The last time I heard that many F-bombs dropped I was wearing Navy blue. Wrestlers with handles like Skinny Timmy, Little Rampage, Little Fabio and Little Show jumped onto each other from the top ropes of the ring, performing flips and body slams. 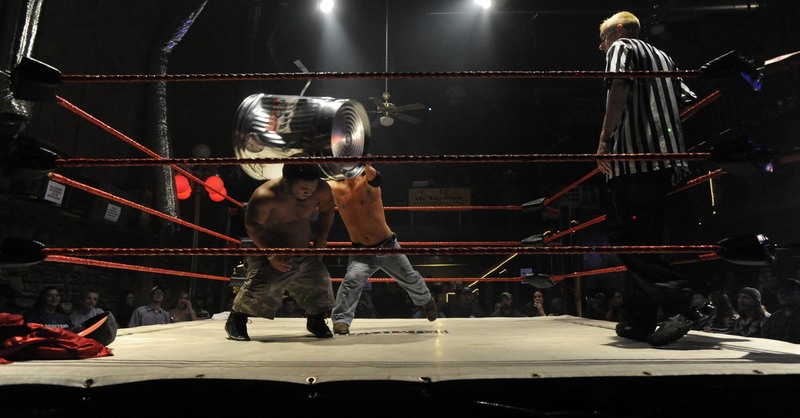 Often the action spilled out of the ring, and the diminutive athletes would take the opportunity to whack each other with a metal trash can or cookie sheet. “Those can hurt,” Brooks said. I took him at his word. One of the stranger scenes was Brooks’ match against Campbell. It was particularly odd hearing people cry out “Baby Jesus” as they exhorted Brooks to show no mercy against his opponent. Spectators have been known to try climbing into the ring, especially at a bar. They agreed you’d have to be pretty drunk to climb into a ring with a wrestler, no matter what his size. “Either drunk or stupid,” Campbell said. “I’d say both,” Brooks quipped. You wonder if there’s a better way to earn a buck. But if you are passionate about something, I guess you’ll pursue it no matter how much Icy Hot you end up rubbing on yourself the next morning. Does a show like this give people a license to laugh at something they otherwise wouldn’t? You could argue that defines the appeal to many standup comedians. “It’s like an oddity show to them. They come out and they watch what they love to see on TV, but in a littler version,” Campbell said. “It doesn’t make you feel weird, you’re not bothered?” I asked.